We brush your pet’s teeth to help with bad breath and fight plaque build-up. We clean your pet’s teeth clean by carefully removing built up plaque off their teeth, followed by teeth brushing. 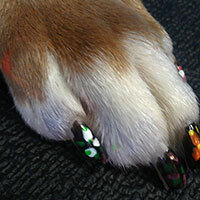 We decorate your pet’s nails with your choice of polish. We bathe your pet in a top quality shampoo and spray with matching cologne that will have them smelling wonderful for longer. Reduces the amount of shedding your dog does at home. We know time is precious so we do offer a straight through service with advanced notice. Just mention you would like the straight through service when setting up the appointment and we will make your pet first priority. Bright White: Whitens dogs (for white dogs only). Deodorizing Shampoo: Helps cure that stinky dog. Flea Shampoo: Gets rid of those pesky fleas. Hypoallergenic Shampoo: Gentle, without fragrance for pets with sensitive skin. Medicated Shampoo: Helps with skin issues. Oatmeal Shampoo: Helps with dry or itchy skin. Skunk Shampoo: Treats pets sprayed by skunks. 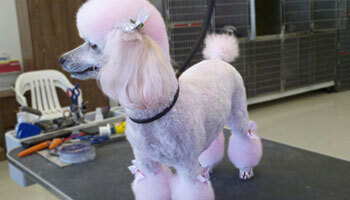 We bathe your pet in a special shampoo that exfoliates their skin. Then they sit in a conditioner to moisturize the hair and skin. Finally, the pet is given a special oil and vitamin rinse to seal the hair shafts that gives your pet’s coat a beautiful and luxurious shine.